RM Education develops hardware, software and services specifically for teachers and learners, drawing on its 35 years of experience providing ICT solutions to education. Although the project was long and complex, the projector install proceeded smoothly and the installation took less than one day to complete. The dual lamp feature has given us a vibrant bright image with the added knowledge that should a lamp fail the redundancy allows us to continue to use the main hall. Challenge: RM Education was commissioned by the London Borough of Barking and Dagenham to provide an extensive range of ICT facilities for two new build projects amassing £22.6m. Two schools were involved, one being Dagenham Park Church of England School. Solution: A range of Optoma projectors were selected for a number of projection installations including the main school hall, as they met the specification requirements along with a reputation for good support, build quality and competitive pricing. Results: State of the art projection facilities in both the performance and classroom spaces, befitting a school specialising in the Performing Arts. 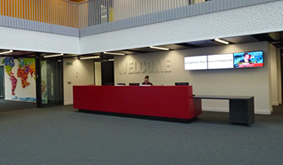 RM Education was commissioned by the London Borough of Barking and Dagenham to provide an extensive range of ICT facilities for two new build projects. Two schools were involved, one being Dagenham Park Church of England School. One of the problems encountered during the installation, was they found keystone correction wasn’t being applied after power on/off on the ProScene EH7500 projector. Optoma technical staff attended on-site and performed a firmware upgrade that rectified the problem. Although the project was long and complex, the EH7500 projector install proceeded smoothly and the installation took less than one day to complete. The ProScene EH7500 with an ST1 lens was installed within the main school hall and 58 Optoma EW766 projectors were installed in the classroom spaces. DLP projection had been specified to reduce maintenance costs for filter cleaning during operation. RM Education approached Optoma to provide the EH7500 and EW766 as they offered the best performance versus price comparison on the market and exceeded expectations in terms of support for high definition, high brightness and installation flexibility. “Initially, the installation was designed to drop the projector from the truss to clear light fittings. 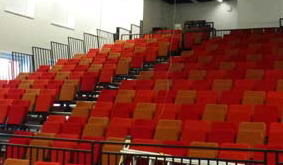 However, due to the raked seating, this meant the projector was in the audience line of sight when they were seated at the back. As a result, the projector mount was shortened. EH7500 provided the flexibility with lens shifting and keystone correction to allow these changes to be made quickly and easily.” – Tony Matthews, Lead Engineer for RM Education. 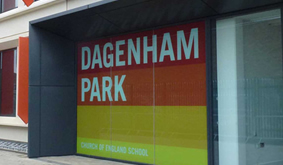 Following the installation, Dagenham Park School now has state of the art projection facilities in the main hall and classroom spaces, befitting a school specialising in the Performing Arts. The EH7500 provided installation flexibility with lens shift and keystone correction to allow any changes to be made quickly and easily. 1 x Optoma ProScene EH7500 with ST1 lens and 58 x Optoma EW766 projectors.